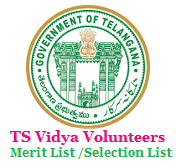 DEO Medak Vidya Volunteers Merit List / Selection List 2018 at medakdeo.in ,TS Vidya Volunteers (VVs) District wise Merit List /Selection List 2018-Telangana VV's Appointment Orders 2016, TS Schools Vidya Volunteers Merit List /Selection List , elanagana VVs selection list, Telangana Vidya Volunteers Merit List/ Selection List Dist Wise appointments 2018-19, TS Vidya Volunteers (VVs) merit list 2018, Recruitment of ts Vidya volunteers merit list , selection list , telangana vvs selection , ts vidya volunteers merit list,Vidya Volunteers appointment list telangana vidya volunteers General Merit list, TS Schools 11428 Vidya Volunteers(VVs) selections 2018, Notification-New Guidelines,Selection Procedure. TS Schools Vidya Volunteers Merit List District Wise Selection List released for the academic year 2018-19 to fill up 15661 Posts in Telangana State. Telangana State government has decided to appoint 11428 Vidya volunteers on a temporary basis for one year vide G.O.Rt.No.86 Date:25.05.2018. The vacancies as per new strength as on 30.06.2016 and as per new rationalization guidelines. Interested Candidates to work as Vidya Volunteers may have to Applied Online for Vidya Volunteers/ VVs/ Academic Instructors Recruitment in Telangana from 01.06.2018 onwards. TS Vidya Volunteers Online Application Closed on 16-07-2018 in 31 Districts of Telangana state. Scrutiny of Application Forms by MEOs 17.07.2018 Submission of Hard copies to DEOs by MEOs 17-07-2018 Publication of General Merit list is on 19-07-2018 Recruitment complete details to collectors:20.07.2018.